Egyptian President Abdel-Fattah El-Sisi reiterated that the decision by the US to move its embassy in Israel from Tel Aviv to Jerusalem would lead to instability in the region. "We have said that this issue would have negative ramifications on Arab and Islamic public opinion, leading to disenchantment, instability and repercussions on the Palestinian cause," El-Sisi, who voiced concerns over relocating the US embassy to Jerusalem in a phone call with Trump last December, said at the National Youth Conference held in Cairo on Wednesday. In remarks broadcast live on TV, El-Sisi called on Palestinians and Israelis to work towards putting an end to the recent bloodshed in the Gaza Strip, after Israeli forces killed 61 Palestinians near the Gaza-Israeli border on Monday during protests against the moving of the US embassy to Jerusalem. The Palestinian casualties in Gaza was the worst in years. 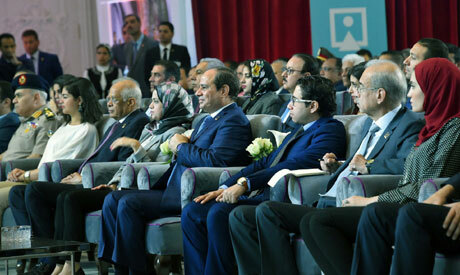 El-Sisi said the Palestinians should make sure "that protest and expression of their rejection of the decision do not lead them to measures that result in the fall of more victims." The president added that the Israelis must "understand that the reactions of the Palestinians to the issue are legitimate," while urging Israelis to be "very careful" with the lives of Palestinians. The president said that Cairo is doing all it can to improve the situation for the Palestinians. Egypt has been in contact with the Palestinian and Israeli sides to help end the bloodshed, has kept its border crossing with Gaza open and has been providing ambulances and medicine to the Palestinians in an effort to "alleviate the impact of the situation in the [Gaza] Strip," El-Sisi said. "We cannot do more than this,” the president said, adding that Egypt makes statements that help resolve the situation, not complicate matters.